A used trailer is more like a box on wheels than a car—if properly maintained a trailer can still be useful after 40 years. Photo by Sara Lieser. It’s buyer beware when you’re shopping for a used trailer, so be alert for any potential problems. 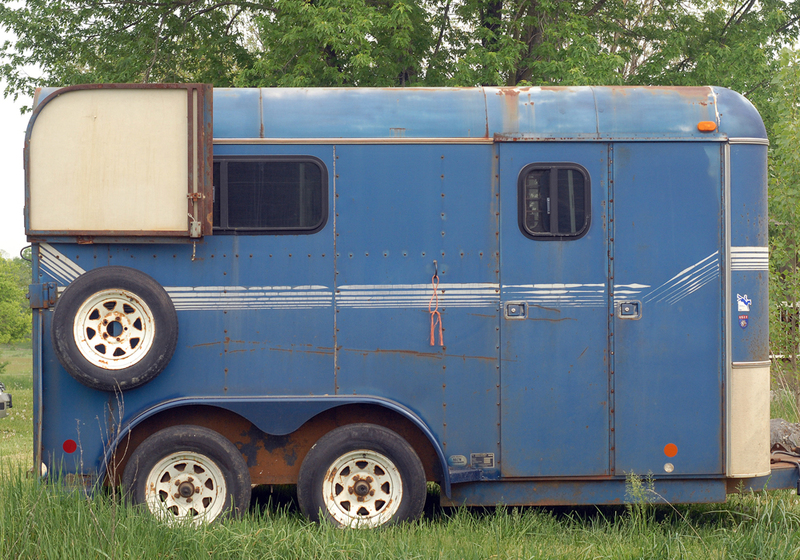 It’s time for you and your horse to hit the road, literally. You’ve saved up and decided that a trailer is in your future. 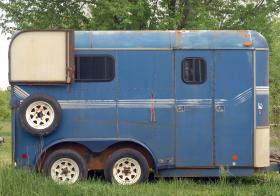 To fit into your budget, however, it has to be a used trailer. There are lots of great used trailers out there, and buying used can be a much more affordable option. But you have to heed the “buyer beware” mantra, so it’s best to be armed with a checklist of items to inspect. Trailers aren’t like cars; they don’t have engines or transmissions and lots of moving parts to evaluate. So used trailers can be just as reliable and safe as new ones. “They’re pretty much a box on wheels, and if you maintain them correctly, they can be 40 years old and still be great trailers,” said Frank DiBella of Frank DiBella Used Horse Vans Inc., a trailer dealership and repair shop in Pottstown, Pa. When you’ve figured out what kind of trailer will fit your tow vehicle and your needs, it’s time to hit the Internet and the pavement. Searching online is a great first step to used trailer shopping, but there are other avenues, too. “Sometimes the best place to buy a good used trailer is at your own boarding barn. Someone says, ‘I want to sell my trailer,’ and you know the people and the trailer and what kind of care it’s had,” said George Yered of Yered Trailer Sales and Service in Medfield, Mass. The horse world is small, so word of mouth might be your most effective “trailer-wanted” advertisement. Just put the word out that you’re looking, and the perfect trailer might pop up. Trailer dealerships have inspected and repaired the used trailers on their lots and might even provide some kind of warranty. Frequently, the dealer sold that trailer as a new trailer, and it’s come back in as a trade-in, so they’ll know the service history. Buying from a dealer can take a lot of the guesswork out of evaluating a trailer’s condition. But what if you found just what you want sitting in someone’s back yard? How can you know if it’s a good buy? Since the basic mechanics of a trailer are simple, you can tell a lot about a trailer yourself. If the basics check out OK, it’s a good idea to ask permission to tow the trailer to a trailer repair shop or state inspection station to get a mechanic to check it out. Or, have a mechanically inclined friend look more closely. “The biggest thing you want to think about, whether a trailer is new or used, is safety,” Yered said. At first glance, does the trailer seem well maintained? Yered has some sage advice about looking at trailers from individual sellers. “If you go look at a used trailer at someone’s farm, go look at their barn and see how they’ve maintained their barn. If the place is a dump—dirty, with fencing falling down—it’s a good clue that they’re not meticulous with trailer maintenance,” Yered said. Go over the trailer’s exterior, making sure all the doors and windows open and close smoothly and easily. If sellers have attended to the small details like oiling hinges, there’s a good chance they’ve taken care of the whole trailer well. Stand in the trailer stalls and see if the trailer feels comfortable, or if it makes you claustrophobic. Adequate ventilation is key to ensuring your horse is comfortable, so make sure all the windows and vents work. Check that the ramp lowers and raises easily. Surface rust on the body of the trailer, as long as it doesn’t create a hole or threaten a weld, is more of a cosmetic issue than a problem. The frame of the trailer is the metal structure underneath that supports the floor and box of the trailer, and it’s the first thing dealers inspect on a used trailer. Rust forms on steel, while aluminum corrodes by pitting, or small holes, in the metal’s surface. Any sign of rust or corrosion on the frame is a problem. Checking the undercarriage of the trailer is especially important in regions that have severe winter weather; the salt used to treat the roads can accelerate corrosion. It’s not enough just to check a trailer’s tires for a sufficient amount of tread, though that should be your first step. Bald tires are of course not acceptable, but even a tire that looks new and roadworthy might be suffering from dry rot, especially if it’s been sitting on grass for an extended period of time. Dry rotted tires have dried and cracked rubber in the sidewalls, increasing chances of a blow out. If the trailer is parked where the sun shines on it, the sunshine speeds dry rotting. And if the trailer is parked on grass, the constant wet-dry cycle of dew and rain does the same thing. The tires can tell you other things as well. Look closely at the way the tires are worn. If the wear patterns are uneven, with more tread worn off one side of a tire, it’s possible the axle is bent. “Most of the trailers constructed in the mid-’80s to now have the torsion rubber-ride axles, and they do bend fairly easily. We’re constantly replacing trailer axles,” DiBella said. Axles can bend if the tires hit rocks or a curb. DiBella recommends standing behind the trailer and inspecting the angle of the tires. If it looks like one tire angles out or in, have the axle checked by a mechanic. The electrical wiring for lights in a trailer is relatively simple. The easiest way to check the lights is to hook up your tow vehicle to the trailer and turn the lights on. “People will say, ‘The last time I plugged it in, everything worked,’ but you need to check it yourself,” said DiBella. You also need to make sure your tow vehicle and trailer are compatible electrically. “To have a light or two out is normal. Unless you see wires hanging down and it’s suspect that the cord is in bad shape, you should be fine. If the plug looks good and the covering is intact, I tend to not be suspicious. But you always need to plug it in,” DiBella continued. Hooking the trailer up to your tow vehicle is the only way for you to test the brakes. Once the trailer is hooked up, slide the manual lever all the way over, and try to move the trailer slightly. You should feel all four trailer wheels resisting movement. Be wary of trailers with brakes on only one axle. “If you’re stopped by the Department of Transportation, they can put you out of service for only having brakes on one axle,” DiBella said. “Most trailers have drum brakes, so the problems are corrosion and wear on metal. Certain states have state inspection on trailers, but New Jersey is self-inspection, and in Maryland the only time you have to have a trailer inspected is when it changes ownership. Trailers that don’t have to be inspected yearly are usually ones that I’m a little leery of, and I’d pull the wheels off and inspect the brakes,” he added. If there are any doubts about the performance of the trailer brakes, take the trailer to a mechanic to have the wheels removed and the brakes inspected. Wheel bearings are the only part of the trailer that you can’t inspect visually yourself; the wheels need to be removed and the bearings cleaned and inspected. Wheel bearings should be cleaned and re-packed yearly. Ask the seller if this has been the case. The condition of the floor of a trailer is critical—the last thing you want is a horse putting his foot through the floor while on the highway. Pulling up the mats and inspecting the floor is vital. If the floor is wood, check the condition of the boards. Pressure-treated wood is the most durable and resistant to rot. But urine is a real threat to any surface. Inspect boards visually for signs of rot, then try to dig a screwdriver or pen into the wood. You shouldn’t be able to penetrate the surface. Concentrate your efforts on the rear of the trailer, where urine tends to pool. The coupler of the trailer connects to the ball hitch on your truck, whether it be a gooseneck or bumper-pull model. As long as there isn’t an alarming amount of rust on the coupler, you should be fine. DiBella advises to make sure that the coupler fits properly over the ball in your tow vehicle. “You shouldn’t have to force it or beat it with a hammer to close or open the coupler,” he said. Also check to make sure that your ball hitch is the matching size for the coupler. “Most of the newer trailers, gooseneck or bumper-pull, have all gone to the 2 5⁄16" ball, where older trailers might have a two-inch coupler. The 2 5⁄16 is a little safer because it has a heavier weight rating. The two-inch balls are fine for a two-horse bumper pull,” DiBella said. Also inspect safety chains, making sure they’re heavy duty and attached safely. Check the battery that powers the breakaway brakes, as well. “If you get stopped for a road check, they will pull the pin and ask you to move the trailer forward to see if the brakes engage. And if they don’t they’ll put you out of service, even if you have a horse on the trailer,” said DiBella. You can pull the pin and test it yourself, or use a voltmeter to test the charge. Ask the seller how often the trailer was serviced. If it’s been sitting in the driveway for years, it might have more problems than a trailer that’s been maintained yearly. An inspection by a professional mechanic could answer a lot of questions.